Ita��s not often that an infomercial on television leads someone down a new career path. But for Arathi Sundaresan, owner of Chennaia��s newest Pilates centre, some late-night couch surfing during her 2003 Christmas break kick-started a new passion. a�?I was studying for my masters in Electrical and Computer Engineering at Oregon State University in the US when I saw an ad for Mari Winsora��s Pilates DVDs. It piqued my curiosity and I ordered it. Soon I started getting compliments about how my body had changed and how toned it looked,a�? she reminisces. Through her marriage (in 2006) and her job (at Analog Devices, a well-known chip design company in New Jersey), Sundaresan kept up with Pilates, which she claims had become an addiction. She took up advanced classes at the New York Pilates Studioa��which teaches the pure form of Pilates based on Joseph Pilatesa�� teachingsa��and also joined its Teacher Certification Programme. a�?It involved 700 hours of training and it took me over a year and a half to complete because I had to juggle work and studies,a�? says Sundaresan. But she persisted, and followed it up with a year and a half of teachinga��accommodating her students after work. The struggle was worth it, though. a�?After years of sitting behind a computer, I was yearning to do something that involved interacting with people,a�? she says. Meanwhile, nebulous plans of relocating to India were in the air. With a baby on the way, she and her husband decided to come back for good. For Sundaresan that meant bidding goodbye to chip designing and starting what shea��s always wanted to do: a�?have a job that pays me for being physically fit!a�? a�?We moved back in December 2012 and I brought along all my equipment. But it took me a year to set up my studio,a�? says the 33-year-old, who is yet to finalise a name for her two-month-old studio in Mylapore. Her biggest competition could be Leap Wellness Studio, one of the citya��s premiere fitness studios. According to Sundaresan, her brand of classical pilates is very different from the more contemporary style offered at Leap. 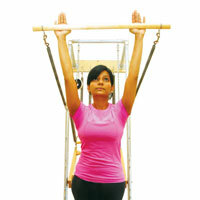 a�?Mine is the first classical Pilates class in Chennai. Unlike contemporary methods, which have modified spinal positioning and introduced other variations, the classical brand (which works with the philosophy of a a�?flata�� spine) is more rigid when it comes to the sequences of exercises. It is also very customisable,a�? she says. At present Sundaresan does one-on-one sessions, which allows her to focus on her clients individually. a�?At the most, Ia��ll take on two people at a time. For now, the studio is open on Tuesdays, Thursdays,A� Fridays and Saturdaysa��from 8 am to 7 pm,a�? says Sundaresan, who is also working part-time as a physics teacher at Akshar Arbol International School until she finds her a�?studio legsa��.